On Tuesday, June 8th, I’m doing something I’ve never done before. I’m taking part in an online book club. 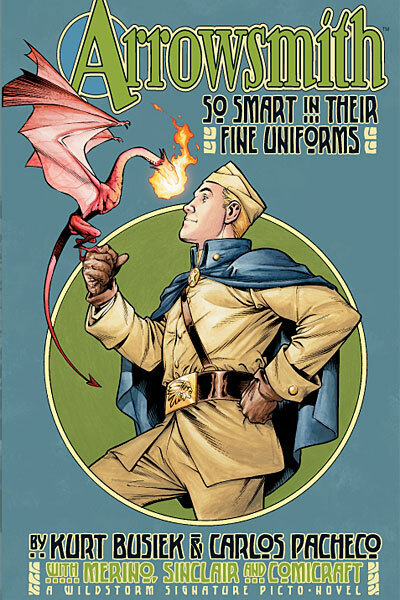 Specificaly, we’ll be discussing Arrowsmith: So Smart In Their Fine Uniforms, the mini-series (and collected graphic novel) I did with Carlos Pacheco, Jesus Merino, Alex Sinclair and the fine folks at Comicraft. The book club is run by Andy Schmidt, for years a Marvel editor, currently a Senior Editor at IDW Publishing, and the author of The Insider’s Guide To Creating Comics And Graphic Novels . The Book Club is part of Andy’s Comics Experience enterprise, which is focused on teaching the craft of comic book writing and the art of breaking in to the business, so I would imagine the book club isn’t just a straight reader-oriented discussion, but will be focused, at least in part, on craft and presentation and will probably veer off to discuss other things I’ve done. But I can’t say for sure—I’ll be finding out myself on June 8. For more information on Comics Experience, on Andy or on the book club itself, click the hyperlinks. Fair warning: Comics Experience is a business, and the book club isn’t free. But I figured I should mention it, because some of you might be interested, and hey, I’ve already had to dig up two sets of headphones (and rescue one from my daughter, who absconded with it to use with the iPod as soon as I’d gotten it working) to make sure I can properly participate in the discussion. I’m looking forward to it. For anyone who’ll be attending—see you there!